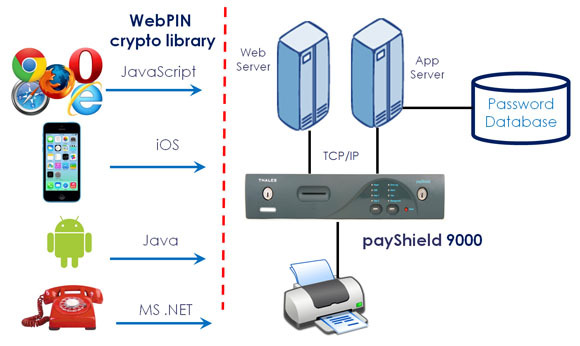 WebPIN provides a secure envelope for the protection of important sensitive customer information during Internet Home Banking and Internet Retail Payment applications. Sensitive data is protected from entry on the client machine in a browser through to its use in the banking host application. In particular PINs used for authorising transactions are protected using standard banking practices and algorithms. WebPIN provides Alphanumeric PIN (AN-PIN) support, a substantial functional enhancement already in demand by banking authorities in Singapore and Hong Kong for Internet banking operations. In addition to AN-PIN, offers a major step forward in the security of the product and is a recommended upgrade for all existing users. WebPIN has been reviewed as a part of Thales ongoing commitment to providing the best in secure solutions and appropriate enhancements have now been introduced in all elements of the product.